Pump, centrif, 825 hp, vert, a/c, 52,100 gpm, 42" x 42"
Subject: Pump, centrif, 825 hp, vert, a/c, 52,100 gpm, 42" x 42"
Centrifugal Pump, Model 112-312-538 , Type WSY BV, manufactured by Allis Chalmers. Rated for 52,100 gpm at 51' head, at 386 rpm. 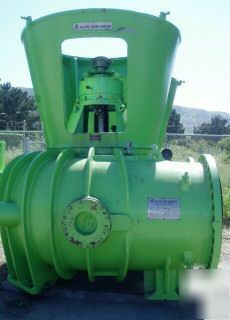 Size 42 X 42, impeller diameter 47.7/43.6, complete with 825 hp drive motor, 416 volt, 3/60 cycle, 395 rpm direct connect motor - vertically mounted (one motor rewound and unused since). Also includes Eddy current coupling, type CAV, air cooled. Last used to control stormwater run-off in San Francisco. In very good condition. Each pump weighs 48, 000 lbs. each. Each motor weighs 42,000 lbs. each. Last used 70-ton crane to unload. Stock No. C733607.